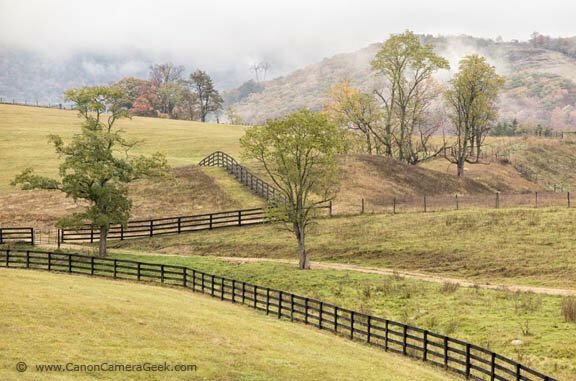 Here are the sample Powershot G1X Mark II Photos from a recent trip to the Appalachian Mountains in West Virginia. 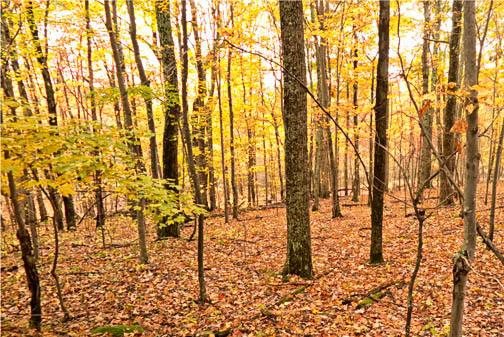 These sample images were taken during a photo workshop that involved the Canaan Wilderness, Dolly Sods, and Blackwater Falls state park. I used my full frame 5D Mark III for the majority of the images from the weekend, but I pretty much never leave home without my semi-pocket-able G1X Mark II. 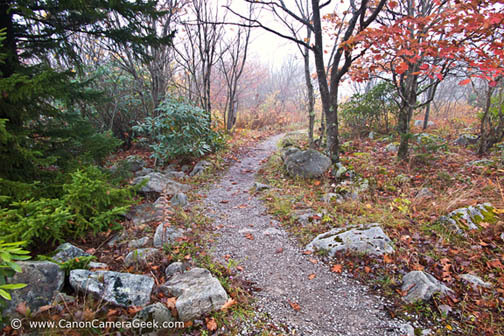 The fog up on top of the Dolly Sods ridge was as thick as pea soup and I came away with no photos on the rocky summit. 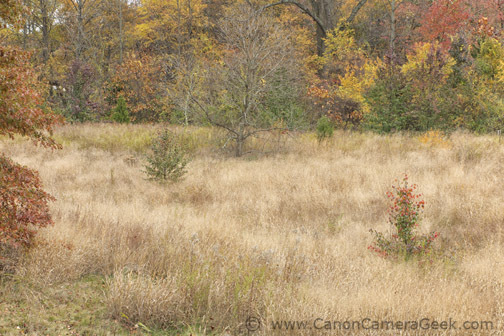 On the way back to the parking lot I took this quickie of the fall colors at an aperture f/3.5 at ISO 500. I was pleased with the acceptable sharpness I achieved with the image stabilization from the G1X Mark II. It was handheld at 1/20 second. The photo below was taken about 30 minutes later at a much lower elevation. Elements of the fog were still present and created some interesting effects in the distance. After coming down from a very foggy trip to the top ridge of Dolly Sods, we were driving along in the valley along Rt. 42 when we came across this quaint farm scene. My Canon 5D Mark III was packed away, but I had easy access to the Mark II during this short stop on the side of the road. Not all of my Powershot G1x Mark II photos came out perfect. 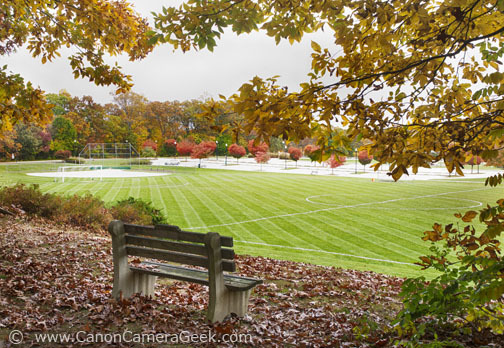 One of the difficult adjustments for me personally as a photographer is how I use auto focus. With a DLSR I use the center focusing spot and "lock" the focal distance by depressing the shutter halfway, then re-composing and making the exposure. This is not practical to do while using the EVF viewfinder on the G1X Mark II. I need to remember to switch over to manual focus when using the electronic viewfinder. The scene above was an explosion of various yellow tones. Despite the fog it was a contrasty situation to handle. The tree trunks were extra dark from being wet and the sky was alomst a pure white from the fog. Although the limited dynamic range of digital photography has always been a disappointment for me, this G1X Mark II handled this situation fairly well. Upon zooming in to inspect the image for sharpness, I did find some chromatic aberrations that had to be correctly in Photoshop. Size does matters most. It's not the total number of megapixels advertised for a sensor, but rather the overall dimensions of the sensor in the camera that produces the best quality image. It's why I do like the G1X Mark II. 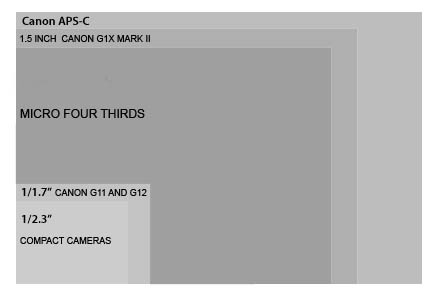 Here is a comparison of a few digital camera sensor sizes, including the G1X Mark II and its 1.5 inch sensor. 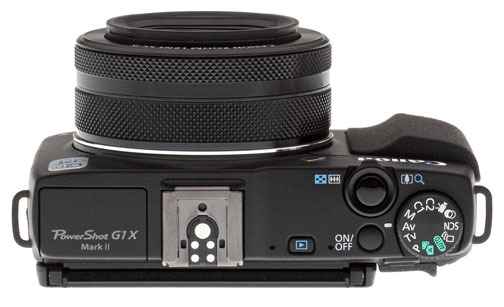 The sensor on the Mark II is only slightly smaller than the APS-C which is prevalent in many of the Canon DSLR cameras. The Mark II was a big improvement over the original G1X, which had focusing issues and disappointing image quality at higher ISO settings. While this camera is much more compact than a DSLR and can easily be used in one of the automatic modes like a typical point and shoot, the design of the controls makes it work smoothly in aperture priority, my favorite shooting mode for over 25 years. The other big plus is having a hot shoe, not only for the EVF viewfinder, but it opens the door for adding a speedlite or alternative flash. Canon speedlites give you the opportunity to create professional lighting styles and great portraits with the 1.5 inch sensor and long zooming lens. The Canon Speedlite 270EX II is my favorite flash to use with this camera because of its compact size. My best Powershot G1X Mark II photos have yet to be taken. 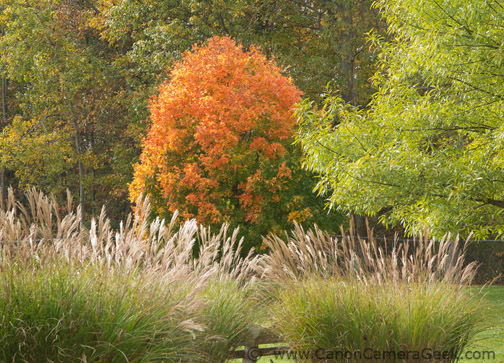 These Powershot G1X Mark II photos were taken during one of the photo workshops offered by Irene Hinke-Sacilotto and Osprey Photo Workshops. You can find more photos of the Blackwater Falls Park here. 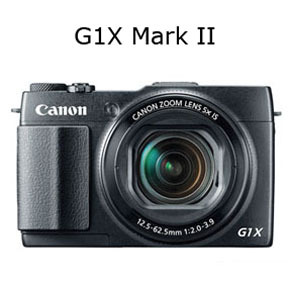 Click the small image below to see an enlarged photo of the G1X Mark II itself.